The days have passed when Floppy Drive was used as Primary Storage Device. Today humans are looking for a Next Generation solution so that they can store huge amount of data in single USB Pen Drive. According to research, 16 trillion Gigabytes of Data will be generated by the end of 2017. So, it becomes more necessary to find much-advanced technology to store huge amount of data on a single device. These days Scientific Americans, are researching on a project in which they can store data in Human DNA. 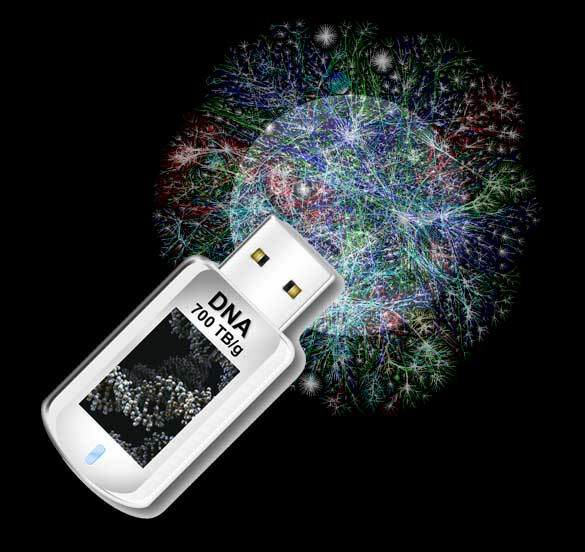 A Pen Drive made by DNA technology can store billions of Gigabytes. Currently, a Pen Drive can store data approximately 128 GB or around 256GB (in some cases). Scientists from European Bioinformatics Institute in the UK has successfully stored and retrieve a large amount of Data using human DNA. According to research 1 gram of DNA can store 2.2 PETABYTES of Data and this could be archived for ten to thousands of years and retrieved with 100% accuracy. A Biological Hard Drive can store Entire Google Content but it is in a testing period. Currently, due to High Pricing of these devices, it cannot be practical with general uses but in coming years it can reduce the cost of Server Storage.